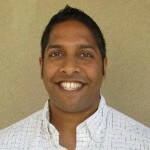 Guest Skeptic: Dr. Anand Swaninathan or Swami to his friends. He is an assistant program director at NYU/Bellevue Hospital in the Department of Emergency Medicine. Swami is an emergency medicine myth buster and a strong supporter of Free Open Access to Meducation (FOAMed). 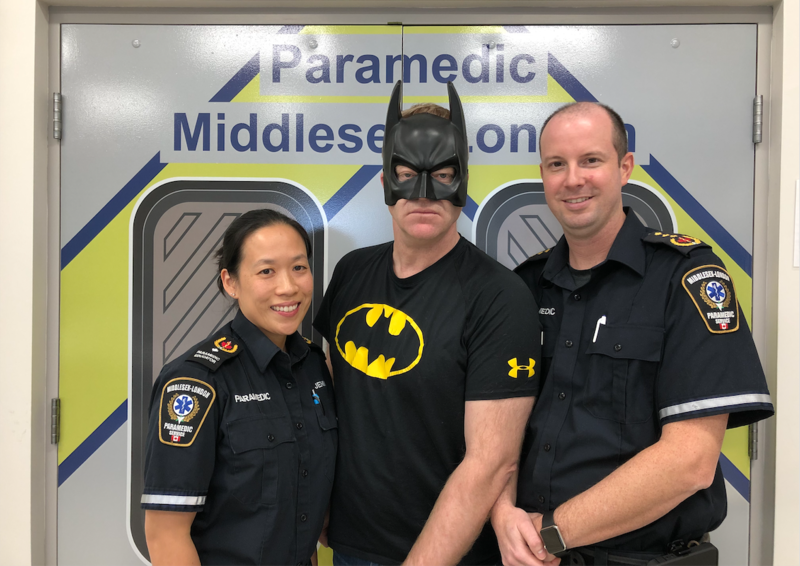 Case Scenario: An 85-year-old woman presents to your emergency department with left leg and arm weakness and slurred speech for the last two hours. She has a history of hypertension and diabetes. Her vitals are unremarkable except for a blood pressure of 202/115. A non-contrast CT head is performed that shows no acute intracranial pathology. Upon return from CT scan, the patient is speaking clearly but still has weakness (4/5) in the left arm and leg. Your stroke team asks you to administer alteplase and admit. Question: Is alteplase and effective treatment in patients who present with signs of an ischemic stroke of less than three hours duration? Background: Each year, 22 million people worldwide will experience a stroke. About 85% of these are ischemic strokes. For years, there were no effective treatments for these patients. As a result, the burden of ischemic stroke was enormous. 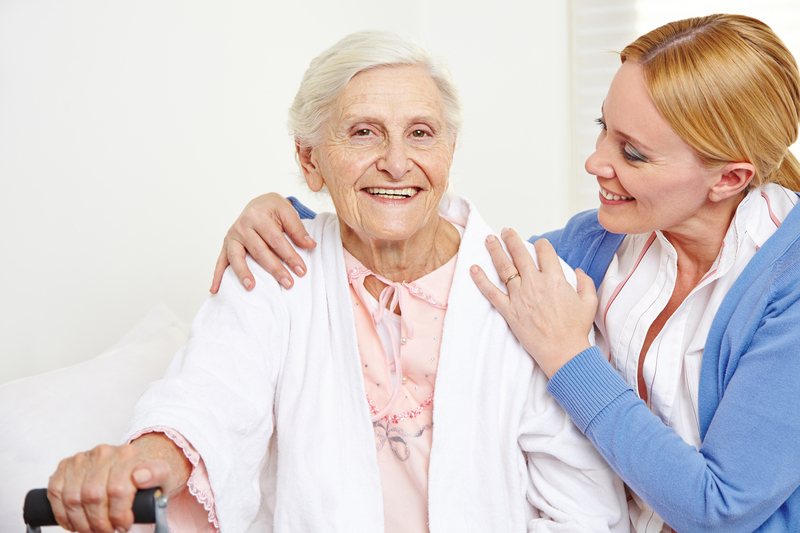 Patients often experience debilitating strokes requiring round-the-clock care. Acute ischemic strokes represent the leading cause of disability in our society and the third most common cause of death. For the longest time there was nothing that could be done acutely for stroke…then enter thrombolytics. Lytic agents were first used in the treatment of myocardial infarction (MI) in the early 1980’s. At this time, the treatment of MI was similarly limited. Stents were not used and so patients either got coronary artery bypass graph or simply had completion of their infarcts while physicians crossed their fingers. The evidence in MI formed the basis for the application of lytic agents, specifically alteplase, to ischemic strokes. 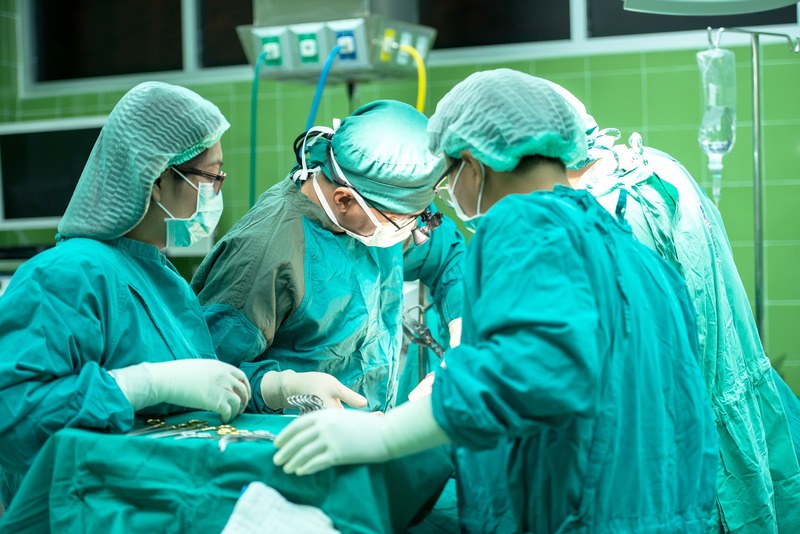 The theory again was that there was a clot sitting in a vessel and administration of a lytic agent would dissolve the clot and improve patient outcomes. “Time is brain” was pushed hard as well but not based on data pertaining to stroke but based on the data pertaining to MI. The NINDS article which we’ll discuss in a bit was not the first trial looking at the utility of lytic agents in stroke. 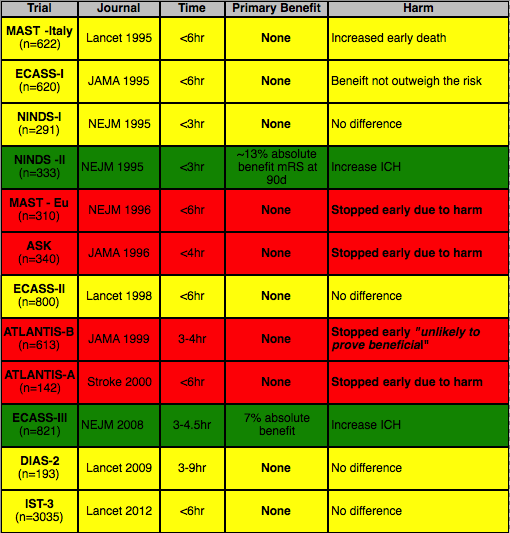 Prior to NINDS, there were two major randomized control trials (MAST-Italy and ECASS-I). Both of these studies looked at a 6-hour time window (i.e. symptoms starting within 6 hours of drug administration) and found no benefit when streptokinase was given. The 6-hour window for stroke came from the MI literature. 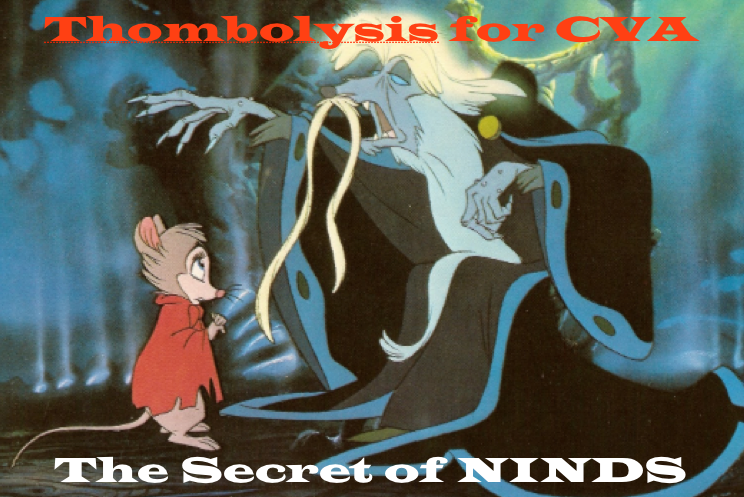 If thrombolytics worked in the heart within 6-hours the hypothesis was that it would work for the brain in a similar fashion. Unfortunately, the two studies you mentioned with >1,200 patients did not show benefit and there was significant harm in the form of increase intracranial hemorrhage. Reference: Tissue Plasminogen Activator for Acute Ischemic Stroke: The National Institute of Neurological Disorders and Stroke rt-PA Stroke Study Group. NEJM 1995. Population: All patients that had an ischemic stroke with a clearly defined time of onset, a deficit measurable on the NIHSS and a baseline CT scan showing no intracerebral haemorrhage (ICH). Excluded: Patients with a prior stroke or serious head trauma within 3 months, major surgery within 14 days, history of ICH, systolic BP > 185 mmHg, diastolic BP > 110 mmHg, rapidly improving symptoms, symptoms suggestive of an subarachnoid hemorrhage, gastro intestinal bleed or urinary tract hemorrhage within last 21 days, arterial puncture at non-compressible site within 7 days or seizure at onset of stroke. Patients taking anticoagulants or received heparin within 48 hours (and an elevated aptt), PT > 15 seconds, platelets < 100,000/mm3, glucose < 50 mg/dl or > 400 mg/dl and patients requiring aggressive treatment of BP to get under 185/110. 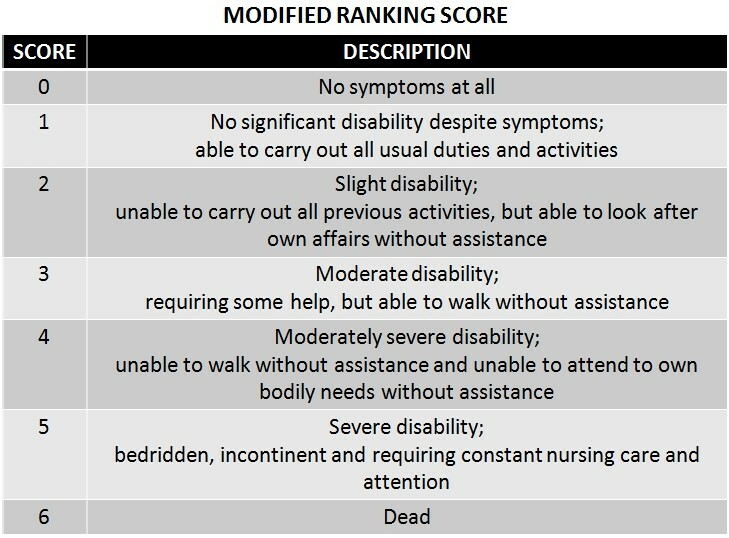 Part 2 – Improvement in Barthel index, Modified Rankin Scale (mRS), Glasgow outcome scale and NIHSS at 90 days. Were patients in both groups were similar with respect to prognostic factors? 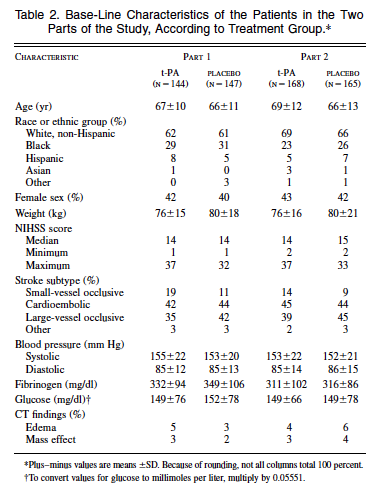 NO – If you look at table 2, you see that the placebo group in both parts had a higher rate of large-vessel occlusions. Subsequent reanalysis of the NINDS data revealed a statistically significant imbalance in initial stroke scale. Was the treatment effect was large enough and precise enough to be clinically significant? YES/NO. Part 1 had no treatment effect. For part 2, unclear as patients were different at baseline. 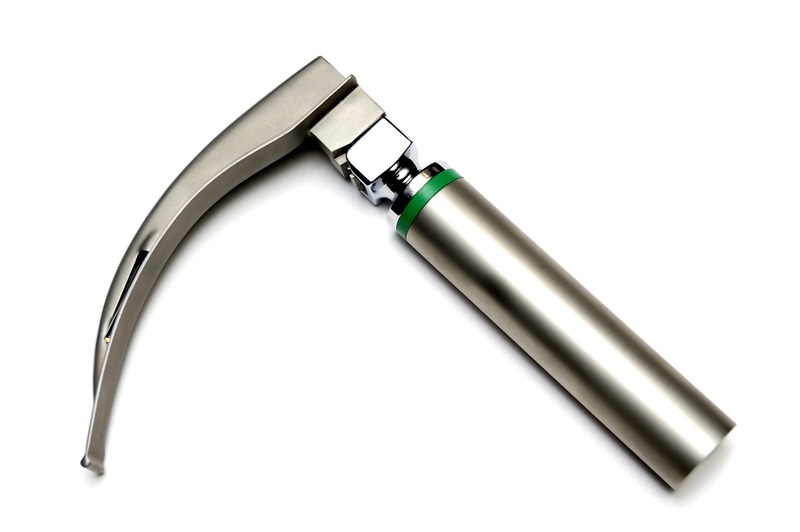 Regardless of which stroke scale you looked at, tPA patients did better. If you look at these results, you would quickly come to the conclusion that alteplase was beneficial in the treatment of ischemic stroke and that the benefits outweighed the harms. However, there are a lot of caveats to this conclusion. The end NIHSS was higher in placebo group but there was no significant change. So the placebo group must have been sicker at baseline. This was shown in the reanalysis of the NINDS data in 2004 and subsequently by a number of researchers. Why does this matter? Well, remember that in Part 1, there was a continuous measure of outcomes. They were looking for a 4-point improvement on the NIHSS. This isn’t really affected as much by the patients being different at baseline. However, in part 2, it was a dichotomous outcome where they showed benefit. If the patients who were given tPA were less sick at baseline, they are more likely to be less sick at the end regardless of treatment. The reverse is true in the placebo group. Since they were sicker at baseline, it’s less likely that they get to that “good outcome” in the dichotomized outcome. Additionally, there was a difference in outcomes if you were treated < 90 minutes versus 90-180. The majority of the benefit seen was in the < 90 minute group but, they lumped them in with the 90-180 group and tried to argue that 0-180 is all the same. It’s not. Why does this matter? Very few patients come in < 90 minutes after symptoms. If you only recommend the drug in this group, it won’t be used very often. Does this change what we do? Of course it did. This study is at the heart of all stroke care in the last 20 years. Stroke alerts, stroke codes, stroke centers, multiple studies and billions of dollars have come from this paper. That seems like a lot for what amounts to a single study of 333 patients with baseline differences showing a benefit. The adoption of tPA by the American Heart Association (AHA) may have been influenced by monetary issues. Genentech (the makers of tPA) gave 11 million dollars to the AHA prior to the AHA endorsing the drug. This is an association and not necessarily cause and effect. I am not aware of any direct evidence linking money from Genetech to the change in AHA recommendation. I admit it does not look very good but we should be careful in any conclusions we make about this part of the tPA story. Regardless, 20 years later, this continues to be a hot button topic in EM. You can see more on the tPA debate here on ERCrit Episode as well as at many other FOAMed resources. This last year, ACEP updated their clinical policy giving a stronger endorsement to tPA within 3 hours and the EM community went nuts. 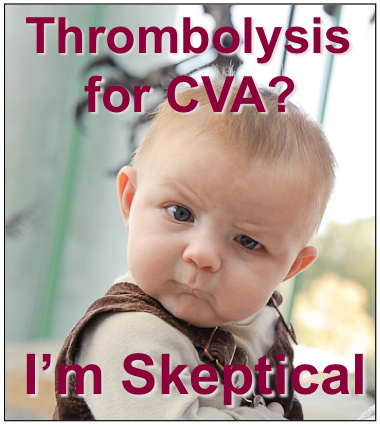 A recent EP Monthly poll showed that emergency medicine community do not consider tPA for CVA a level “A” recommendation. 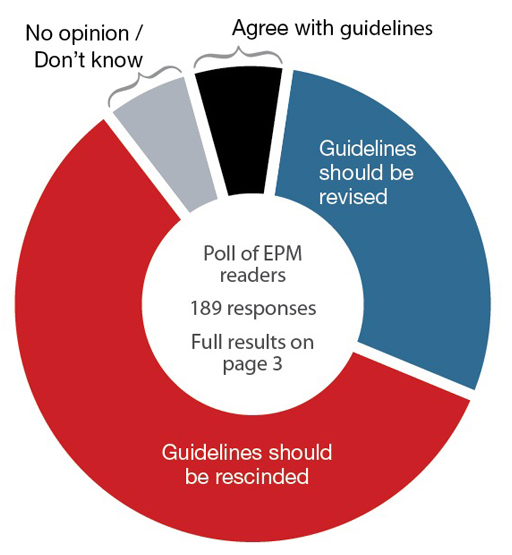 There were 88% of physicians who thought the new ACEP guidelines should be revised or rescinded. The guidelines did leave some wiggle room by saying “should be offered”. However, there are only two randomized control trials that have shown benefit. There was this NINDS-II which showed better outcome at 90d if treated within 3 hours. The other positive study was ECASS-III showing benefit with treatment between 3-4.5 hours. Four studies were stopped due to harm or unlikely to prove beneficial. Six studies showed no overall benefit. Green=good, Yellow=no benefit and Red=stopped early. On a more personal level, NINDS is what led to my evidence based medicine (EBM) interest. I had a case my 1st year as an attending where a patient who may not have been appropriate for the drug got tPA and had a massive and fatal ICH. This case prompted me to go back and read up on NINDS the preceding and subsequent studies and critically review them. You could say that tPA got me hooked on EBM. Case Resolution: Based on your in depth knowledge of the NINDS study, you point out to the neurologist that the patient may be a poor candidate for tPA based on her presenting blood pressure, her age and the fact that her symptoms have been improving while in the ED. The neurologist and you have a discussion with the patient and her family about the risks and benefits. Given her improving symptoms, they elect to decline tPA treatment. The patient is admitted to the stroke unit. A week later, she has 4+/5 strength in her upper and lower extremities and she is speaking clearly. She is discharged to the rehabilitation center for further care. Keener Kontest: Last weeks winner was again from Poland. That is two weeks in a row. Jarek Gucwa from Kraków identified three important things in sepsis care. These were early recognition of sepsis (get lactate levels), lots of intravenous fluids and broad-spectrum antibiotics. If you want to play the Keener Kontest listen to the podcast for the question. Email me your answer at TheSGEM@gmail.com with “keener” in the subject line. The first person to correctly answer the question will receive a cool skeptical prize. I would like to give a special shout out to Dr. Jerome Hoffman for being a skeptical mentor on this topic.